This second joint human and veterinary cardiology symposium is a logical follow-up of the First one, and took place over the weekend of 1st and 2nd October 2011. 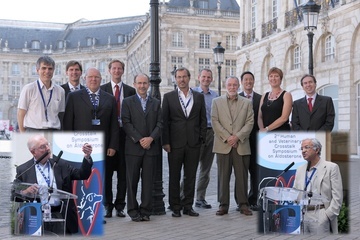 Over one hundred world experts in human and veterinary cardiology were welcomed to Bordeaux. The specialists spent all day Saturday discussing the latest research. Each theme was addressed in turn from the human and veterinary medicine viewpoints, and the rich discussions brought up plenty of ideas on both sides. This site presents each presentation and a summary of the discussions that came out during each session as well as the different printed supports. We hope that you will both enjoy and benefit from the research compiled herein. Bertram Pitt, Jonathan Elliott, Jens Häggström, Claudio Ronco, Adriaan Voors, Allan Struthers, Frédéric Jaisser, Adrian Boswood, Clarke Atkins, Mark Oyama, Rebecca Stepien, Michele Borgarelli and Faiez Zannad. Where are we with aldosterone escape (Break-through) in 2011? How to use biomarkers in cardiology ?